In developed areas, roofs, pavement, and other impervi­ous surfaces prevent stormwater from soaking into the ground. Instead, it runs over the land surface and is routed into storm drains or directly into small tributaries and larger streams. Unable to handle the increased water volume and flow, these waterbodies often experience eroded banks, incised channels, loss of habitat and aquatic life, and increased flooding and prop­erty damage. In addition, stormwater carries a broad mix of toxic chemicals, bacteria, sediments, fertilizers, oil and grease to nearby waterbodies. Retaining as much stormwater as possible on the land— rather than letting it run into storm drains—can help keep harmful flows and pollutants out of our streams and rivers. Low Impact Development (LID) is one crucial tool used to deal with the stormwater runoff problem. LID is development that results in low impacts on natural resources by trying to mimic more closely the natural water cycle process. This is done by using planning and designs that preserve green space and manage stormwater to minimize increases in flow and pollutants. LID techniques include conservation of forests and sensitive waters, water reuse, and stormwater controls that detain and retain runoff. 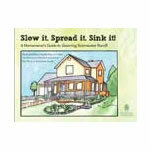 The RCD has created a guide for homeowners titled Slow it, Spread it, Sink it! that provides an array of information for those interested in using these techniques at home. Water Catchment (Rain Barrels and Cisterns): Rainwater collection is an excellent opportunity to slow water down by temporarily storing it. Captured water can be reused for irrigation or other non-potable options or metered off slowly after storm events to allow for infiltration and reduced flooding. Rain barrels are small- to medium-sized containers placed outside buildings and connected to roof downspouts to collect runoff for later use in non-potable applications. Rain barrels have many advantages in urban settings. They take up very little space, are inexpensive, and easy to install. Rain barrels conserve water and reduce the volume of runoff moving off-site. Water tanks (Cisterns) are manufactured water storage containers for non-potable use in residential, commercial, or industrial applications. Water tanks can be installed both above and below ground. Tanks can be used with most guttered roofs to collect runoff and reduce runoff volume. 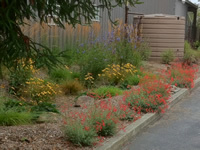 Rain Gardens: Rain gardens are vegetated basins installed at homes to capture and detain runoff, facilitate water infiltration and groundwater recharge while providing an aesthetic landscaping benefit to landowners. Rain gardens consist of a basin that is adequately sized to capture stormwater from a specific area, such as roof downspouts. The garden temporarily holds water, as opposed to shedding it away, allowing it to infiltrate in the soil. Most rain gardens have some sort of soil, gravel, or other media installed as an underlayment to facilitate the infiltration of stormwater. They are placed at natural low points in the property and are planted with water tolerant plants that are able to thrive in saturated soil conditions. Although they are best suited for soils with high infiltration capacities, they can be installed in a variety of soil types from clays to sands. Keep in mind that rain gardens built in clay soils may require importing soil as well as installing drain pipes to effectively drain the garden and avoid long periods of standing water. Swales: Swales are shallow channels designed to convey, filter, and infiltrate stormwater runoff. They can be designed to be a meandering or almost straight depending on the amount land available on the site. The three primary types of swales are grassed swales, rock lined swales (dry creek beds), and bioswales. Grassed swales are vegetated with native perennial grass species along the bottom and sides of the channel. The vegetation in the channel slows stormwater, allows sediments to filter out, and can even help remove nutrients. Bioswales are vegetated swales that use engineered media beneath the swale to reduce runoff volume and peak runoff rates. Bioswales have a greater capacity for water retention nutrient removal, and pollutant removal. Pervious surfaces: There are many new types of pervious materials that allow runoff to pass through and sink back into the soil. 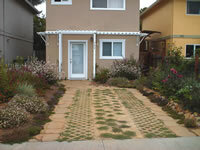 Some popular choices are paver stones, turf block and permeable asphalts and pavements. The RCD can provide services for homeowners or landowners who are interested in installing stormwater management practices or low impact development projects on their property. Federal, State or local funding may be available. Contact us for more information. Proposition 84 funded stormwater projects and local resource list. View our publication Slow it, Spread it, Sink it.